I've been a little LOT behind in reading my favorite blogs lately, but have you seen the awesome link up that Pam and Sarah are hosting each week? It is such a great idea! I've been dying to join the fun, but honestly can barely manage to get meals on the table, let alone complete any extra projects. Don't ask me how I was possibly able to get ready, order and decorate cakes, and make those First Communion and Baptism Favors... It was just plain old stubbornness all extra grace God must have sent my way! Still, when I saw Charlotte's 3rd Pinning It Down post this afternoon, I decided not to let another week go by without joining in the fun. 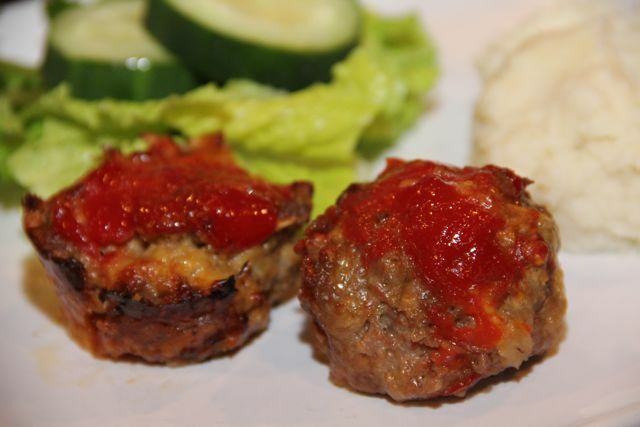 Since I needed to come up with something for dinner anyway, had a couple pounds of ground beef defrosted in the fridge, and had just pinned a recipe for Mini Meatloafs from My Blessed Life, I decided to give it a shot. 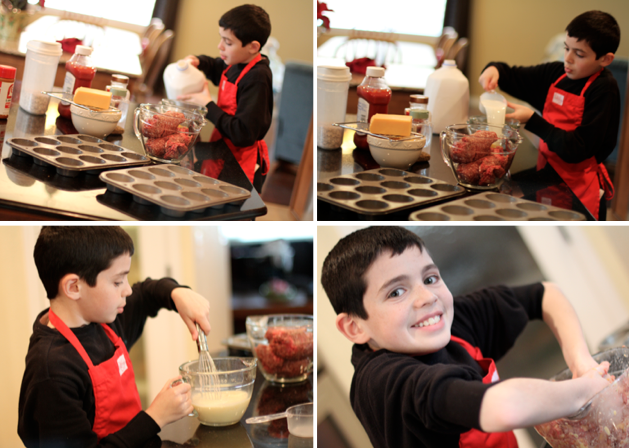 He was more than happy to learn how to make another recipe and did a great job! In fact, when he was finished he went on to make a batch of Outrageous Bar Cookies, which are almost ready to eat. I am so, so thankful for my big helpers! The recipe is very similar to the one we made when I was growing up, except I loved that this one suggests making miniature meatloafs instead of one large loaf! We doubled the recipe for our family, making 20 mini meatloafs, which ended up being the perfect amount. 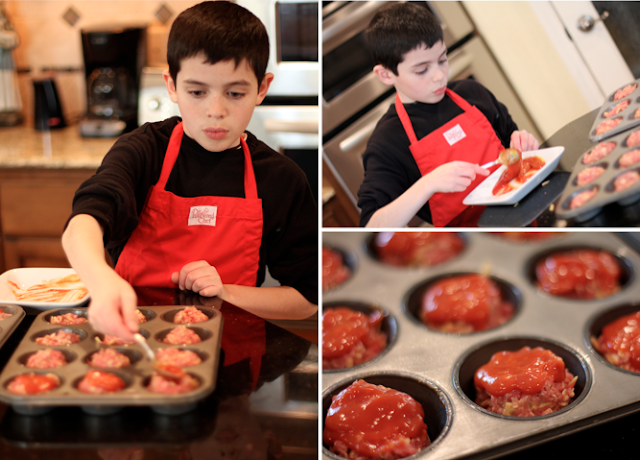 Before you get started, preheat the oven to 350 and lightly spray a muffin pan. What a darling little chef you have! He looks like he's relishing that task of mixing the meatloaf by hand :) (that's the part I HATE!). I've never thought to make mini individual servings before- what a great idea! Way to go,Captain! These look so good! I'm going to have the boys make some for us! What a wonderful thing to have such a willing set of helping hands!! :) I LOVE the idea of putting the servings into the muffin tins. Sometimes I make individual servings, too (because they bake so much faster, lol!!) but this looks like such an easy/neat way of doing it...great idea! Can't believe you just made these. I make these all the time for my kids whenever I make a big meatloaf, but I have a few silicone mini pans in shapes like hearts and stars that I got from the dollar store that I make them in. The kids love them. So fun. I know! Honestly I hardly ever make meatloaf... Maybe once every couple years... but we will be making it more often since the kids liked these so much, and since they can help make it! :) Great idea to use different shaped pans! Looks like he had fun! My daughter loves helping make meals too. She might enjoys this recipe.